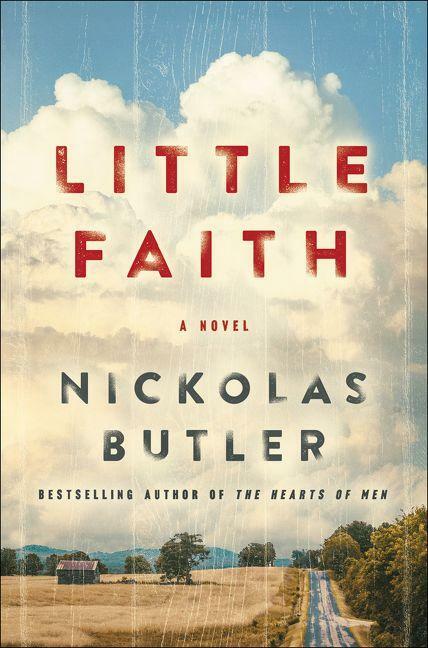 "I researched prayer healing in America a whole lot, but I began thinking that would be a really dark book if that's what the only narrative thrust was," notes Butler. "So I started thinking that a way to camouflage that or toggle that would be to write a story about a grandpa and his grandson and that kind of amazingly sweet, special relationship between the very old and the very young — and trying to braid those two stories together." Little Faith is told through the experiences of 65-year-old Lyle Hovde, who is generally content with his life, and his role as a retiree, grandfather, and occasional apple harvester. The book plays out over the seasons of a year, and leads Lyle — and readers — to ask some deep but fundamental questions about the nature of faith and religion. "Lyle believes in something beyond the plain of normal human existence, but he can't quite go into believing that there's a God in the clouds, and he can't quite believe in the Bible, he can't quite believe in church. So I think, and not to sound 'new agey' or anything like that, but he sees beauty in the natural world. He sees beauty in the orchard that he works in and the seasons and in his grandson, but he really is jaded on organized religion," he says. Lake Effect's Mitch Teich with Wisconsin writer Nick Butler. Transitioning out of one industry and into another can be challenging, especially after multiple years on the job. For many professional athletes, by the time they retire or are forced from the game by injury or obsolescence, they have been in their sport for 20 or 30 years. For too many of them, they find it difficult financially and emotionally to adjust to life after sports.